Ladies and gentlemen, welcome to my words. Today marks a wonderful occasion as, finally, we come to the epic climax of how a Boba Fett game would excel. Today, we will discuss experience points, leveling up, and, most importantly, combat. Are you excited?! You Fett your sweet bottom you are. Alright, now, let's get this party started by talking about combat, and what this game should strive to be, and what it shouldn't. This game's combat should not be reminiscent to a run-of-the-mill shooter. You see, in our day and age, cover-based shooters are running rampant. And, because of this overused gameplay feature, chest-high walls are becoming a predominant part of society. Or maybe that's what games want the future to be; an English-speaking person on every corner of the world, and a chest-high wall in every yard. But, games should strive to be more than something generic, and so should a Boba Fett game, as he deserves more. Thus, this game should give players the choice of how they want to engage enemies in glorious combat. First (I'll be deviating from cover for a few, scant seconds), I want this game to feature the choice of playing in a First-Person or a Third-Person view, much akin to The Elder Scroll series, though vastly improved upon, of course. For some, First-Person would be enough; seeing Fett's weaponry, his arms, and a nifty visor view. 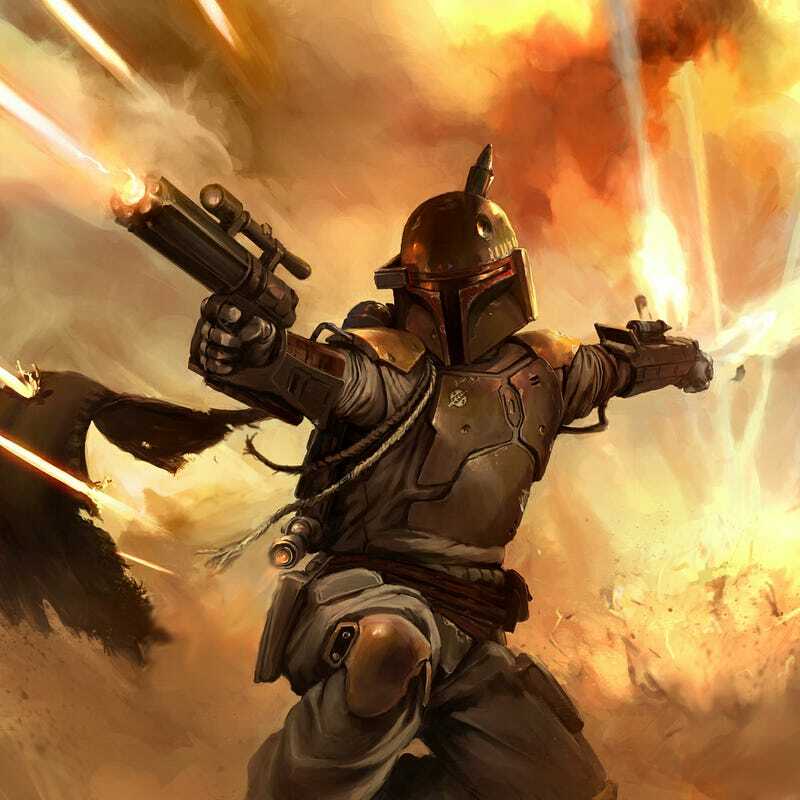 But, for others, we want to actually see Fett while we play. So, we give the choice. Play in what view you wish, because you have waited for this game for so long. Secondly, cover will definitely be featured in the game, though it may not always be entirely necessary. Now, since cover will play a somewhat small role (compared to other TPS) of this game, where walls won't be littered around and strewn about, as that tells the player that a fight will surely be on their hands, we will be able to take cover on other things, such as fully-intact walls, space dumpsters and even speeders. We can, again, choose to be in First-Person or Third-Person while in cover, much like in Killzone (FP cover), Tom Clancy's Rainbow Six Vegas (FP to TP cover mechanics), or Uncharted (TP cover). It must be noted that we will not be invincible behind cover; we can still take damage and the cover can be destroyed. I'll elaborate on this more later on, as it will be tied in to gaining experience. Lastly, I do not believe that melee should play a significant role in this game. Boba Fett is a capable fighter, and that should go without saying. Though, if melee was predominately involved in the game, the game could, very well, suffer from an identity crisis. So, we keep melee to a minimum. If an enemy gets in close, and we wish to stay silent, we can insta-kill them with a melee. After all, before there was Assassin's Creed, there was Republic Commando, and it featured a hidden blade. Alright, with that outta the way, I believe we can discuss a little more about quests, and a lot about experience. I'll keep this part brief. You don't get experience for completing quests, in this game. Bounty hunters don't get paid in experience, they get paid in credits. These quests are your money providers, your life-blood as a bounty hunter, just like it should be. Sure, you will get some credits for pilfering your foes' remains, but it will take a long time to get that new blaster you want that way. So if you want money, complete a bounty. However, you will earn experience during quests, depending on how you play. Experience bars are neat! In fact, it's a great way to show the progress you're making in a game. However, I have problem with them. In fact, I have a huge problem with how you gain experience in most games. You see, experience implies that you are gaining knowledge, or know-how, on something specific when you are doing it. Well, that's how it's supposed to work, at least. So, when I play all these different games, why do I get experience for turning in a quest after I've already done all the work? I'll give you an example: I'm tasked with finding space syrup which can be harvested from a nearby moon. I find the syrup, turn in the quest, then I level up ... and suddenly I'm more adept at shooting people in the head! I understand why it's done like that. I know that it's the norm. But that's not how it's going to be done in this game! In this Boba Fett game you will have 4 different skill trees: Ranged, Survival, Pyro, Surveying (Please note: The 'Ranged' tree leaves it open for Melee, if an expansion were to be released, and we could make Melee combat work)! For every specific action you do in this game, you will gain experience points in that action's corresponding skill tree. With each tree gaining experience, and leveling up, separately, it caters to your play style. Ranged: This is your blaster tree, obviously. Each kill with a blaster will yield XP for this tree. You can specialize in single blasters, dual, or rifles. You can learn all three specializations if you so choose, but keep in mind that there will be certain abilities that are for locked to specific specialization types. This tree will also affect how adept you are at your aiming, how efficient you are with your ammunition (can increase mag capacity), and how quickly you reload, among other things. Pyro: This is your flamethrower and grenade tree. This is the tree you need if you want to make sure everything in a square space-mile stays dead. The more you deal damage, and kill with these weapon types, the more powerful your explosions, and flames are. Flame effects last longer, and have a much wider arc. Your flames can spread from one person to another. Also, your explosives have a larger blast radius and you become more skilled in throwing them, meaning you can throw farther and more accurately. Survival: If you run-and-gun then you are going to get shot. A lot. This tree improves your effectiveness at being a blaster sponge. As this game will not have regenerating health, you will need bacta to stay alive! Good news is there's Bacta Packs (or some other cliche medkit name). This will make your packs more effective at healing you. You will also have more health. This tree is your evolution tree, essentially. Over time, your body will get used to being shot, so you won't take as much damage. You also become more skilled in healing yourself, so packs will heal more life, as well as there being a chance that you don't use the entire health pack. Cover plays a role in this, as it helps you make your cover more effective at protecting your body. You can hunker down further in cover, and it will give boosts to the defensive stats that your cover gives you, but you still won't be immortal, though there is an alternative to taking cover — Smoke screens! This tree deals with smoke screens and distractions, because that is one way to keep yourself alive. Drop a smoke screen and disappear from battle to flank your enemy! As with everything else, your smoke screens will be more effective, will last longer, and have a large radius. Also, you will gain XP for each shot fired into the smoke that don't hit you. Surveying: Jetpack! I want to explore the heights of the cities we visit. Or even use it to escape a grenade that was just tossed your way! Our jetpack will last longer and we will have a longer reach with the grappling hook, because Boba Fett has one — because Boba Fett. Now, much like Crackdown, I want combos to be involved in this game. Shoot someone with a blaster, but get the kill with a rocket? Experience points get divided up between both trees, and will distribute them accordingly. You could even be in cover, getting shot, and deploy a smoke screen (survival). You jetpack straight out of the smoke (Survey) and then decimate your foes with rockets and blasters, in mid air (Pyro and Ranged). There you just made a combo dealing with all four skill trees! You are a maverick renegade. There we go. I believe I have stated most of the things that were on my mind, regarding gaining experience, and how combat should go.